Done. Added new "defaultSymbolName" option. You can use it for each template. If not provided, 'example' will be used. Done. And added new "submenu" option. You can use it for each template. Also, it should work properly when AA window is called from "not main Memory Viewer"
And below post taken into account. I've done some minor tweaking since the last build you guys helped me make. I will take a look at this as soon as I am able. -Can you provide examples for their usage (for separator and sub-menu)? Can we set this example script up to also add custom pointer address to our table with the address value of example_address? I have teleport and vac templates, for example, that I always have to add the custom symbols to my table after I create the script: save1, save2, load1, load2, vac_enable, xyz etc., and being able to have these entries generated automatically would save me a lot of time. Can you provide examples for their usage (for separator and sub-menu)? 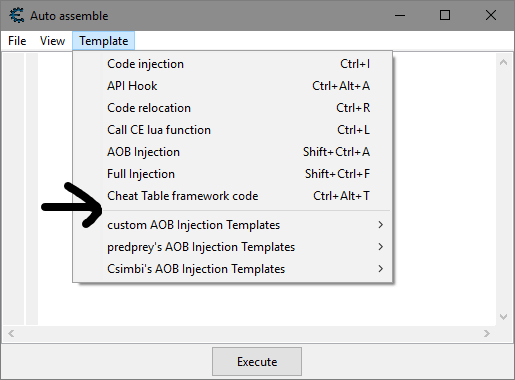 "Alternative AOB" entry will be inside "custom AOB Injection Templates" sub-menu. Yes. It is possible with CE6.6+ from SVN (at least in my fixed build). We have to wait for next official release. Explanation: currently, lua block inside AA script doesn't know in which memrec it is executed. In next CE version we can use new local variable "memrec". Thank you, so much, mgr.inz.Player. The sub-menus are working great! Having the memrec feature will be awesome! It will allow me to automate just about everything. I don't suppose that it would also allow me to automate hotkey assignment? Haha...that's getting lazy, I know. That part is not necessary. By the way, I am still unable to get the additional separators working. Maybe I did not communicate well on that. I keep trying different things, but I am just guessing with this. With your script, is it possible to create these separators in the same way that we can with the sub-menus -- to separate our custom templates? For example, I have a sub-menu that is only for x64 templates. Inside of that sub-menu, I would like to separate stealth templates from 2-D templates and 3-D templates etc.. I don't suppose that it would also allow me to automate hotkey assignment? Haha...that's getting lazy, I know. That part is not necessary. Currently, without memrec local variable, we have to use getMemoryRecordByDescription if we want to create memory records appended to main memory record. And description must be equal. If more entries with the same description, only the first one is provided. Ohhh, I got it. I can add this feature with ease. Awesome! 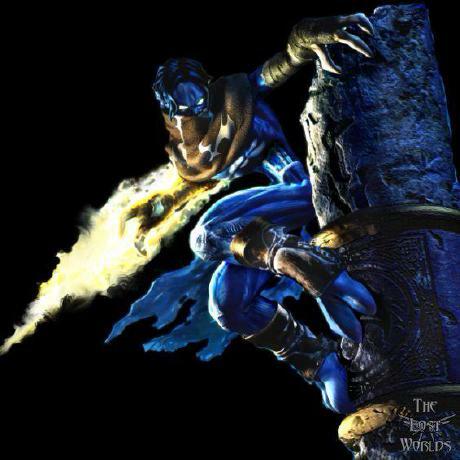 Thanks, so much, mgr.inz.Player. The new memrec feature sounds awesome. Latest version 1.3.1 will make separators automatically. Now with changed group from 2 to 1 for "Alternative AOB with Stealth"
I will try to test this later. +rep will have to be later, also. big thx for this idea, your work and working examples. but i made for myself something more universal. if anyone interested in this, here is 3 different samples below. i know that it's not "very clear" but easy for workaround. how can i automate add/print bytes that are around (before and after) %searchPattern% or %originalBytes%, to my template, by manipulation with your constants? Using a name such as "mp" confuses the scripts logic as it mistakes the 'mp' in 'jmp' as the cheat name and mistakes its following code for being the %aobAdjust% string. Using "jmp" as the cheat name still bugs out, though I have not yet need such a cheat name yet. 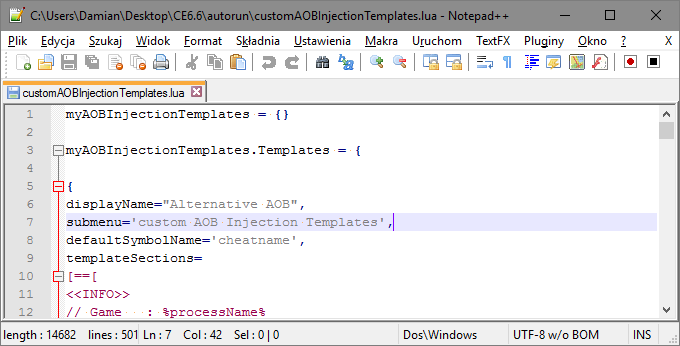 On CE 6.8.1, when loading the template : "Error:...eat Engine 6.8.1\autorun\customAOBInjectionTemplates.lua:365: attempt to perform arithmetic on a nil value (local 'size')"
I don't know if you ever planned to support this version. Anyways I'm not very resourceful in LUA and know nothing about the different versions/engines. Weird. I am using it (well two-three of them) almost every day and I have never seen this error. Could you have some other LUA files installed that may interfere? BTW, which template are you trying to use?